GP-RN: The White Noise of A NO Campaign In Chaos. 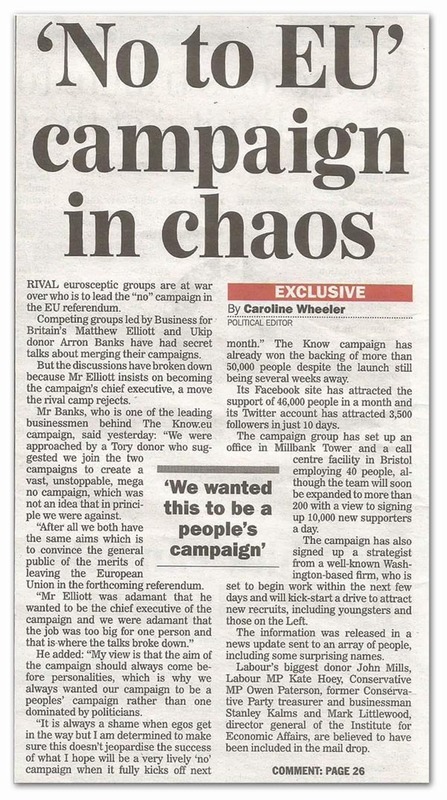 Many people were dismayed yesterday to see in the Sunday Express assertions that the “no” campaign is in chaos, after merger talks between competing groups broke down. The groups involved are said to be Business for Britain, led by Matthew Elliott, and TheKnow.eu, led by Ukip donor Arron Banks. And according to Banks, the process started when the groups were approached by a Tory donor who suggested a merger “to create a vast, unstoppable, mega ‘no’ campaign”. Now we are told, the discussions have broken down, attributable entirely to Mr Elliott who insisted on becoming the campaign’s chief executive, a move which Mr Banks rejected. And, as might be expected, this “evidence” of discord has been seized upon by Breitbart which thus claims that the “establishment” campaign may lose us the referendum. On the other hand, Autonomous Mind believes there is little to choose between these two groups and the other player, Ukip’s Nigel Farage. Between them, he feels, they have ensured that the “no” campaign is all but beaten. Not least the behaviour of Nigel Farage in using the referendum campaign as his own personal platform is going to do much to discredit the cause. Pete North has his own observations and conclusions not dissimilar to AM. The crucial point he makes, though, is that there may need to be a subsidiary or branch of the official “no” campaign working under a different identity to differentiate itself from the white noise created by these groups. However, it is not just these groups which are creating white noise. There is no more reason to trust the Sunday Express on this story than any of the many others it produces. There is far more to the Elliott/Banks story than has yet to emerge, and some assertions which the paper makes are unreliable. In some senses, the situation is not quite as bad as the Express paints. There are moves afoot which, if not entirely satisfactory, hold out some promise of making a useful contribution to the fight. For the moment, though, we have a different sort of noise – on the immigration crisis. This, for the moment, the media is determined to turn into a major political event. Yet, with probably more than two years to run before the referendum, what is dominating the headlines right now may well be a distant memory by the time the voters head for the polls. And if Mr Cameron ever did have any ambitions of conducting an early poll, these must surely by now be abandoned. There can be no gain for the Prime Minister in asking the nation for its decision with the media in such a febrile mood. Those who were banking on an early poll have miscalculated – more so since the dynamics of a prolonged campaign are very different than those of the sprint, where all the arguments must be compressed into a short period. Crucially, there is a measure of all three of the high-profile “players”. All have allowed themselves to be bounced by the media speculation (on the basis of no good evidence) into starting their campaigns this September – a month which starts only a day from now – instead of biding their time. When we should be planning, recruiting, organising and – above all – training our people to provide a coherent, well-disciplined force, we will see energy frittered away on ill-conceived, premature campaigns by people who have little understanding of the complexities of EU politics and the forces ranged against them. Ironically, Banks is to bring in an immigrant from the United States to tell us how to run our strategy – even if one has yet to find a Septic who had any serious understanding of the EU and its related politics. That apart, the idea of a “vast, unstoppable, mega ‘no’ campaign” is something of a fantasy. A single campaign at this stage would simply have meant errors being perpetrated on a bigger scale than they are already. At least currently, there is some competition and creative tension. It is only this which allows us to be vaguely optimistic. Unity around flawed ideas and tactics would simply have meant the death of the “no” campaign. There is time yet – but getting the strategy right is far more important. And that will probably have to come from outside these self-appointed groups anyway. Why are we not allowed to know? … and if the UK public find out about this after..? As I haven’t seen such…. I did a petition… and…. it was accepted. Both sides must highlight this in the media. of some help in following this very valid point you have made.